In the 1960s, jazz legend Sun Ra applied to NASA's art program. Somewhat of a glorified PR campaign, the program mostly funded cubist portraits of astronauts and artist imaginings of space colonies. But Ra had much bigger ideas about the program's potential. "Without the proper type of music, your program will be more difficult than need be," Ra wrote in his application. "You know it is said, 'Music soothes the savage beast,' and what is called man is very anarchy-minded at present." The application, framed on a white wall in a new art exhibit, Monuments: The Earth Expedition of Sun Ra, reads like a prophecy. 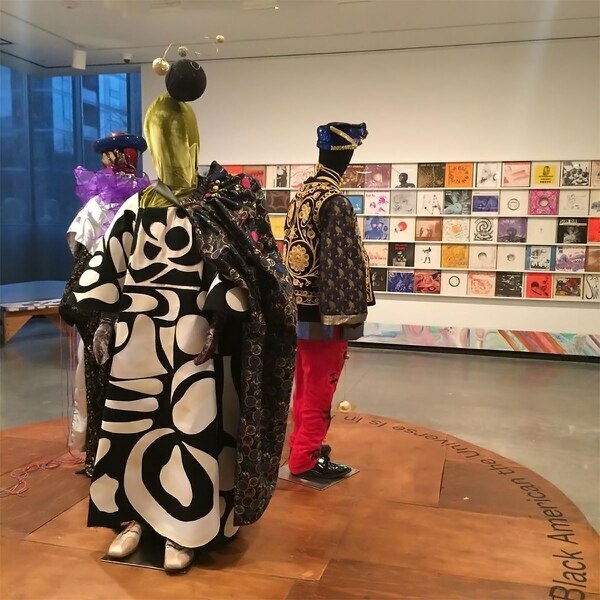 Hidden on the top floor of the Portland Art Museum's contemporary art tower, the exhibit is the largest Sun Ra retrospective yet. 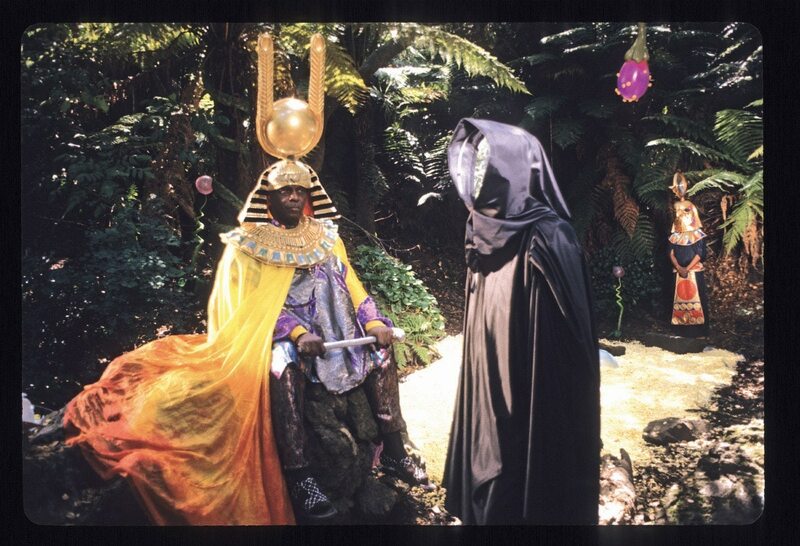 Along with the frenetic, cosmic jazz that Ra composed with his band, the Sun Ra Arkestra, Ra and his collective are perhaps best known for the Afrofuturist clothing they wore on and offstage. Re-creations of four such opulent outfits are displayed on a platform at the center of one of Monuments' two rooms. There are dozens of rare vinyl sleeves laid out on a wall like tiles, along with glass cases containing never-before-seen artifacts from the Arkestra's communal home in Philadelphia, including intimate photos and sketches of album covers. Monuments is the final show in We.Construct.Marvels.Between.Monuments, a five-exhibit series helmed by curator Libby Werbel, founder of Portland Museum of Modern Art, which holds exhibits in the basement of Mississippi Records. For each show in the series, Werbel worked closely with a different group of Portland artists who typically operate outside commercial art institutions, all of whom are artists of color. Monuments is the work of Deep Underground (DUG), a collective that hosts a monthly open mic along with other artist gatherings. 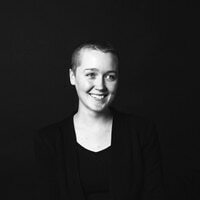 "What I was really thinking about [with the series] was, how do we highlight and show the marvelousness of art happening on the fringe of institutional recognition?" Werbel says. "[It was] intentional to kind of end on this, thinking about creating new monuments, and the museum as an old, dated monument, and how do we tear down old constructs and build new ones." Monuments feels less like a Sun Ra retrospective and more like a living shrine or sanctuary. At the entrance to the exhibit, a lush display of vine plants frame a gold, 3-D-printed bust of the musician wearing his most iconic headpiece—a pharaoh's crown topped with what looks like a giant tuning fork cradling an orb. There's a video collage of the Sun Ra Arkestra projected onto the wall in a dark corner of the exhibit where you can sit swallowed in a couch with a tall back and comfy cushions. In a hallway with black walls, there are stations with headphones to listen to samples of the Arkestra's massive catalog. The exhibit seems just as concerned with the grandeur of Ra's legacy as with his smaller moments of genius. There are several framed stills from his 1974 movie Space Is the Place, including one of a Ra wearing a zen expression and roped to an airchair. The didactic card for the still plainly reads: "Sun Ra kidnapped by the CIA, tied to a chair and forced to listen to Sousa Marches on headphones as a form of torture." Unlike most retrospectives, Monuments isn't interested slotting Ra's work into a pre-existing canon. "It's twofold. It's looking at somebody we think is definitely underappreciated and underrecognized," Werbel says. "[And] how institutions also have a hard time doing work around finding, sourcing and creating opportunities for under-recognized artists." It's a difficult balance to assert an artists' place in history while also questioning the basis of history. Even writing an article about Monuments is just another iteration of evaluating art in a context it doesn't care to be in. But DUG's introduction to the Monuments slices through the idea that all of that is some kind of paradox. The collective points to rhetoric like "Abraham Lincoln freed the slaves," as an example of how recognition is wrapped. "No," the collective writes. "The enslaved people fought and died to free themselves, and so long as the majority of statues, public sculptures and landmarks in this country are in reference to colonialism and its leaders, an accurate story of this country is not being told." Though that's the only place where DUG overtly separates its voices from Ra's, that desire to leave behind the dominant cultural and literal language rings throughout the exhibit. In a 1970 San Francisco Chronicle article that's displayed on one of the exhibit's walls, Ra explains why he dislikes the word "birth" to describe his arrival on Earth. "This birth thing is very bad for people. The word should be abolished," he says. "Supreme beings have trapped humans with words and one of them is birth." In that way, it's difficult to talk about Sun Ra's work without measuring it according to the structures Ra's backstory places him beyond. So Monuments lets Ra do the talking. DUG selected one of the musician's poems to caption a particularly iconic 1974 portrait of Ra in his headpiece and a long red gown: "Faith can be a bridge/Between what is called reality/And what is thought to be myth/For myth is a word/And a world all its own." SEE IT: Monuments: The Earth Expedition of Sun Ra is at the Portland Art Musuem, 1219 SW Park Ave., portlandartmusuem.org. 10 am-5 pm Tuesday-Sunday through Jan. 27. $20 museum admission.